Appears to be very narrow from the tee, and a tee shot anywhere in the fairway is a good. Most players are left with a mid-to-short iron approach. A par on this hole is a great start to The Vineyard. Another narrow par 4 with water on the left and right. Most players will hit a long iron from the tee, and at only 350 yards, will be left with a short iron approach over water. This short par 3 can be very challenging. It’s only 125 yards, but with a small green, tee shots not finding the putting surface will most likely land in the water or in the environmentally sensitive area. This mid-range par 4 is normally your first legitimate attempt at a birdie. With a fairly wide landing area, players that hit the fairway are left with a short iron approach. Another mid-range par 4 that has no trouble on either side. A well-placed tee shot will leave most players with a short iron approach. With one of the more undulated greens on the course, two putting can be tough. Make sure you take enough club on this 150-yard par 3. With the prevailing wind blowing into the player’s face, club selection can be tough. Anything short of the surface will end up in the environmentally sensitive area. This short par 4 is drivable for longer hitters. However, it is very well guarded by environmentally sensitive areas. Most players will hit a mid-iron off the tee, which will leave them with a wedge for their approach. This challenging, narrow par 4 requires a well-placed tee shot. Players who don’t hit the fairway may end up in the environmentally sensitive area, or may be blocked out from the green by trees. Par is a great score on this hole. This shorter par 5 is reachable in two for many players. Beware the water on the right, which is blind from the tee. This medium length par 4 is a great way to start the back 9. The fairway is wide, but players must avoid the driving range on the right side. A well-placed tee shot will provide a short iron for most players. This long par 4 is one of the tougher holes. Good tee shots will normally leave players with a mid-to-long iron for their second shot. Walking away with a par is a great score. 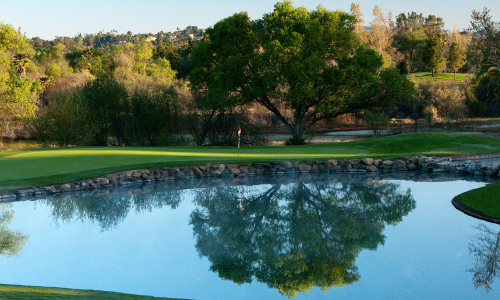 This 150-yard par 3 is well guarded by water in the front. Take a little extra club off the tee to ensure clearing the water. With a pretty flat green, two putting is not a problem for most players. Hole 13 is the longest par 4 on the course. At 477 yards many players are intimidated. However, with an elevated tee, well-placed tee shots will leave most players with a mid-iron second shot. Make sure to avoid the water on the left on this longer par 4. Most players that hit a good tee shot will end up with a mid-iron for their second shot. With one of the trickier greens on the course, two putting can be tough. This par 5 will only be reachable for longer hitters; however, hitting two well-placed shots will give most players a short iron or wedge onto the green. Walking away with a 4 is certainly possible on this hole. This long par 4 can be very difficult. With an uphill tee shot to a blind landing area, players are pressed to hit a good shot. Most players are left with a mid-to-long iron for their second shot into a tricky, undulated green. Par here is a great score. This mid-range par 3 will have most players hitting a mid-iron off the tee. If you hit the green, you’ll be left with a pretty easy two putt. The finishing hole at The Vineyard is a workable downhill par 4. 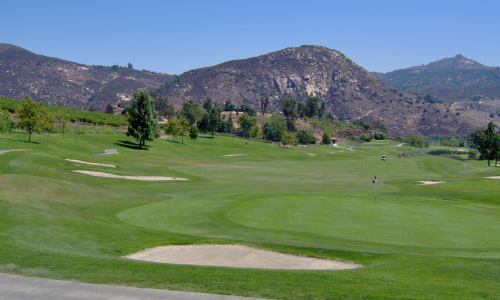 Players must avoid the driving range on the right from the tee box. A nice shot will leave most players with a fairly straightforward mid-to-short iron onto the green. Rates are subject to change without notice. Hours vary seasonally. Holiday Rate will be charged on all course, federal, and state holidays. Please call the course to confirm current information or if rates are not listed. 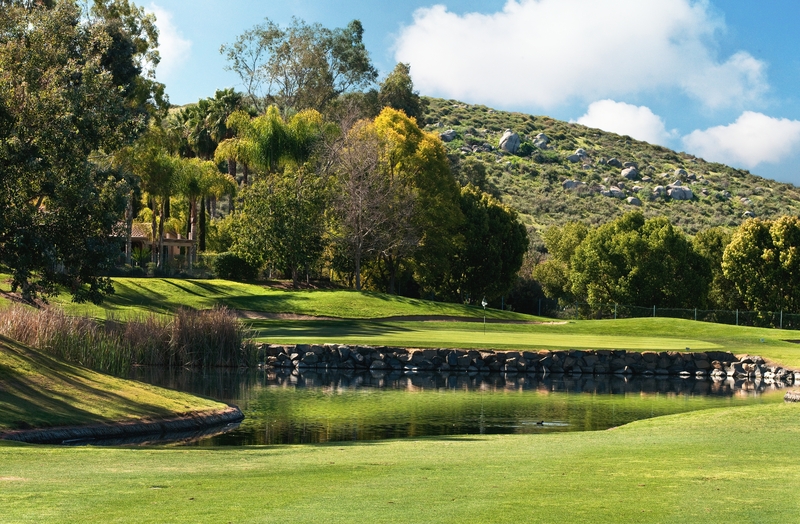 Considered one of the finest daily fee facilities in San Diego, The Vineyard at Escondido’s par 70, 6,531-yard course winds through a scenic landscape of verdant wetlands, set against stunning mountain vistas, acres of untouched wildlife preserves, and flourishing grape vineyards. Water is in spectacular abundance with five lakes spread out across the landscape, so accuracy is vital, as it is on the signature third hole, a deceivingly simple 125-yard par 3 over water. 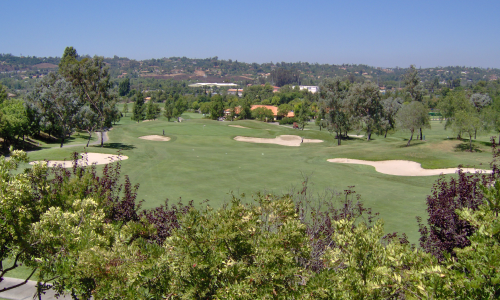 At once charming and challenging, with exceptional service and facilities, you can always expect an enjoyable day of golf at The Vineyard at Escondido. (760) 735-9545 or click here.